Spinal Research is delighted to announce that International event rider and Olympic team silver medallist, Nicola Wilson will be joining Mary King, Nick Skelton, Claire Lomas, Francis Whittington and Andrew Gould as an ambassador for ‘Saddle Up’. ‘Saddle Up’, the dedicated rider campaign for Spinal Research, has grown from strength to strength since it was launched 13 years ago and with the fantastic support it has received from equestrian riders and the public this has enabled it to continually fund vital and groundbreaking research into finding an effective treatment for paralysis. Every day three people in the UK and Ireland are told that they will never walk again; their lives and those of their families are changed forever. Too many riders, both amateur and professional, are paralysed each year as a result of a riding accident. The charity, is therefore, appealing to equestrian enthusiasts, riding clubs, Pony Clubs, riding schools, equestrian centres and livery yards to support it by organising a fundraising event such as a charity show, tack sale, quiz night, or by holding a sports event. Nicola is fully supportive of this wonderfully important charity and is calling for as many people to hold a fundraising event, and everyone who signs up to run an event by Friday 4th April, will be entered into a draw to meet Nicola at a competition, with the person raising the most money from their event not only getting the chance to meet Nicola, but also the opportunity to follow Nicola and her team around at a competition to see how they work together to produce such top level event horses*. To be eligible for this fantastic opportunity to meet one of GB’s leading event riders, please register your idea or activity online www.spinal-research.org or call our ‘I believe’ New Year Resolution hotline on 01483 898786 by Friday 28th February 2014. 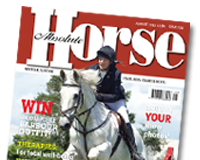 All Mountain & Moorland (M&M) Champions at Horse of the Year Show (HOYS) will once again be invited to compete for the ultimate accolade of Supreme Pony of the Year, when the Show returns to Birmingham’s NEC from 8th– 12th October 2014. Petplan Equine, is calling on the equine world to recognise the invaluable work of equine charities by nominating their favourite for the 2014 Petplan and ACDH Animal Charity Awards. The awards were launched last year by Petplan in partnership with the Association of Dogs and Cats Homes (ADCH) to recognise the hard work, dedication and commitment of animal charities and not-for-profit organisations, their employees and volunteers. To nominate a charity team or individual who deserves to be recognised for their outstanding contribution to equine welfare go to www.petplan.co.uk/charityawards. Nominations open 6th January and close on 31st March.